Recording Any video calls into MP4 & AVI movie files. Easy to use for your Facebook, Skype, Google Hangouts video interviews, conferences, podcasts, or family calls. It is a screen-capture recorder, the recorded video quality is same as what your see. Very easy to record and playback. Capture any video and audio calls data to record with high quality. Record any video calls directly to your hard disk. Free record computer screen with 4K UHD quality output. Record Skype/Hangouts/Facebook/Teams video calls for Free. Option to record the video calls into MP4 or AVI files. Option to record separate MP3 audio files. Option to record both sides sound, local sound only and remote sound only. Easy to use with friendly UI. FREE download and FREE to upgrade. 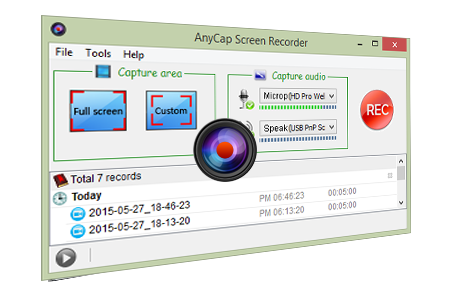 "I really like your AnyCap screen recorder. Though there are a lot of similar softwares around I found yours the best. Simple and does what its out to do! " "Amazing software! It's very useful product. I like it quite a lot..."